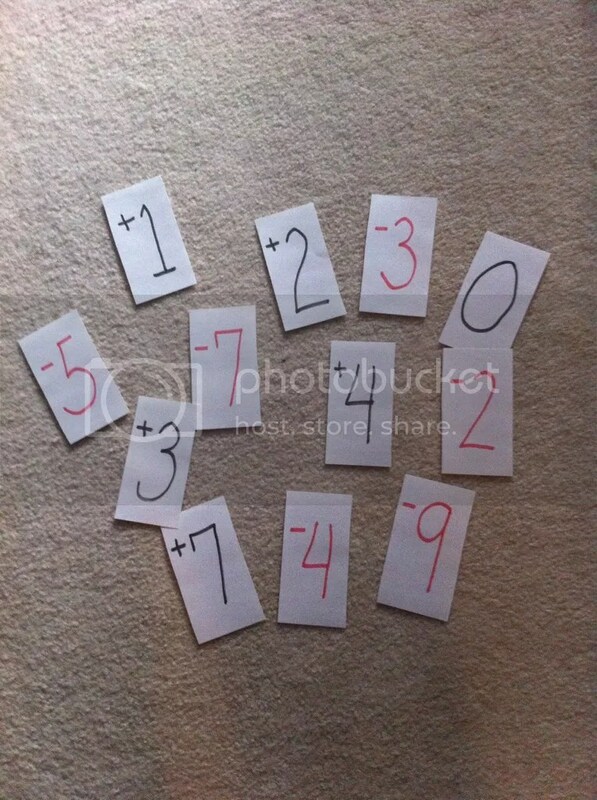 Print out or scribble out cards with the integers -12 to +12, or use my handy integer card set. This will give 25 cards, and you can adjust the cards based on the size of your class. Give each student, except 1, an integer card. The student who does not get a card will act as the observer during the activity, and will verify the class’ actions. 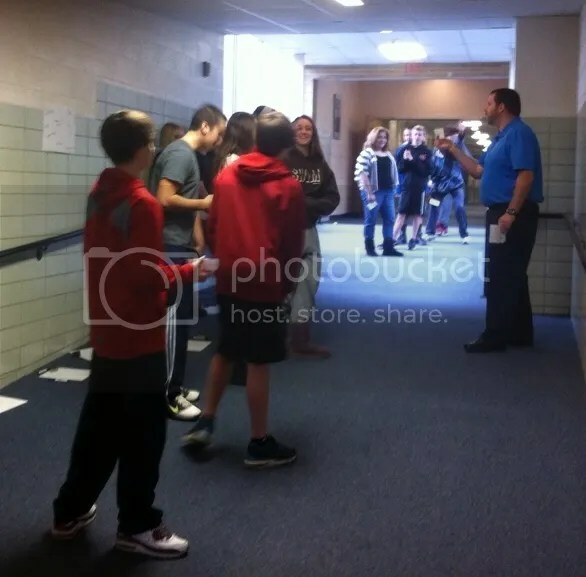 In a hallway, or outside on a nice day, have students sit in order from lowest to highest. The students are making a human number line. It is important that their card be clearly visible at all times. The class observer should verify that all students are seated in order, with somewhat equal space between them. With students seated, the teacher holds up an inequality. Any student holding an integer which is a solution to the inequality will stand, thus making a human solution set. The job of the observer is to verify the correctness of his class-mates solution. 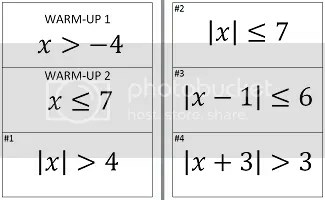 My inequality cards file starts with two warm-up problems, to make sure the instructions are understood, before we start to head into the absolute value inequalities. One of my colleagues used this activity with his class recently, having students step forward if they were a solution. He also added a twist I hadn’t thought of: having students hold their hands over their head to make an “open circle”, if they were a boundary number. Have students trade cards, or totally re-mix after 2 problems. If you don’t, the students with “end” cards can simply follow the crowd. This is a great time to find a class leader to be observer, or uncover a hidden talent of a shy student. Keep those cards visible. Give them the responsibility to keep things orderly. If you have room, take pictures of the human number lines, and use them later as a review, or to keep around the class to build the team spirit. Using this activity a lot, or with many classes? 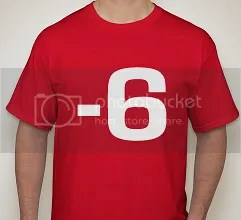 I always thought it would be neat to have integer shirts for this, and to use through the year. After we have developed some ideas about absolute value inequalities and their solution sets, it’s time to start formalizing our thoughts. If you need more hands-on practice, click on the graph link below to try a Desmos demonstration with sliders. 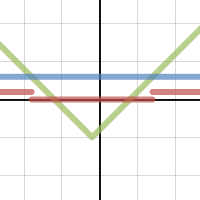 Compare the absolute value function (in blue), to the constant function (in green). The comparison (in red) allows us to look at make greater/less-comparisons. Let me hear about your Human Number Line experiences! This entry was posted in Algebra and tagged absolute value, inequalities. Bookmark the permalink. I love this idea! I’ll try it with my students this week. Are the cards still available?